Section 6.0: INTRODUCTION & FORMATION of the M.R.E.S. Between 7–November–1945 and 28–July–1947 I was one of the operatives for the R.C.A.F. with the R.A.F. / Commonwealth Forces Missing Research & Enquiry Service (M.R.E.S.) based in Europe. My initial assignment was Scandinavia and once this was completed I moved on to the American zone of Germany. The Missing Research and Enquiry Service (M.R.E.S.) was set up at the end of WW2 with a mandate to locate Commonwealth forces personnel who had gone missing or had died in missions over enemy held territory. The MRES turned into a worldwide organization that took the search to the battlefields and scoured millions of square miles to account individually for and bury their list of missing men and women. As the missing were found, they were ticked off of the list. The FOREWARD to the Air Ministry REPORT 55/65 Ref: 6.1 on the 1944 to 1949 MRES operation comments "…..(activities) concern a novel, often unpleasant and arduous task. ….. but, in the results achieved very satisfying to the (search officers)………. Particular tribute must be paid to the part played in this work by the Dominion Air Forces and by the individual Dominion officers… This was a joint effort and the Dominions made their full contributions to it." This is a bit surprising since of the 17,000 Canadian Flyers killed during WW 2, almost one third have no known grave. It is important to recognize the efforts of one Canadian, Squadron Leader William Mace Mair of the Royal Canadian Air Force, whose work was deemed so outstanding that the Royal Air Force recommended him for an Officer, Order of the British Empire award which was gazetted in January 1948. With this account, I will provide a limited, but sufficient, insight into some of the day–to–day workings of the units I was associated with. I’m told that every single RAF casualty file still exists in a huge secure depository at Hayes, UK. The problem is that the files are to be "weeded" of sensitive personal information before release. That is a gargantuan task and I cannot imagine how or by when it will be done, if ever. (It should be noted however that the final relevant M.R.E.U. report, minus exhumation records, were forwarded to the appropriate Dominion air forces (R.C.A.F., R.A.A.F., R.NZ.A.F.) for inclusion in service records for their MIA/KIA. For R.A.A.F. crewmen, certain declassified service, repatriation and MREU records that have gone through the vetting process can be accessed on-line Ref 6.22 . "Around the world I search for thee..."
The web site "RAF Missing Research Enquiry Service (MRES)" Ref: 6.3 nicely summarizes the background to the formation of the MRES. “During the 1939–1945 war, over 40,000 airmen from the RAF and Allied Air Forces were reported as missing on operations or routine flights. The responsibility of establishing, as far as was possible, what had happened to these men, fell to the Air Ministry Casualty Branch. During the early years of WW2 it soon became apparent that the system for tracing the remains of aircrew deemed "Missing Believed Killed" was totally inadequate. The Missing Research Section (M.R.S.) of the Air Ministry was set up in 1941 to deal with this problem. It collected and collated intelligence reports from a wide variety of official, unofficial and covert sources in an attempt to establish the fate of missing aircrew, using forensic or semi-forensic work to identify personal effects passed on through clandestine channels or bodies washed up on Britain's shores. The task was enormous, and made particularly difficult due to the nature of air operations where an aircraft might be lost at any point from take off to landing back at base. During the war years, investigation of missing aircraft and crews was hampered because of the difficulty in obtaining information at long range from overseas in occupied countries. Information about the fate of the missing airmen reached the Casualty Branch in various ways. The missing aircraft investigations were carried out from an office in London and relied primarily on the International Red Cross with its headquarters in Geneva. From time to time the International Red Cross Commision received from enemy sources news of casualties which they passed on to London. The "news" was incorporated into long telegrams referring to numerous crews. Each item in the telegram might include a date, a type of aircraft and the fate of some or all of its occupants, known or unknown: thus " 8/4; Lancaster: Smith, Jones captured; Robinson, Brown and two unknown dead". The place of crash was not mentioned and no burial particulars given. The I.R.C.C. telegram was usually followed by a schedule called by the Germans a "Totenliste, or Death List". This most often confirmed the data in the IRCC telegram and sometimes gave a burial place. For security reasons the place of crash was not given. 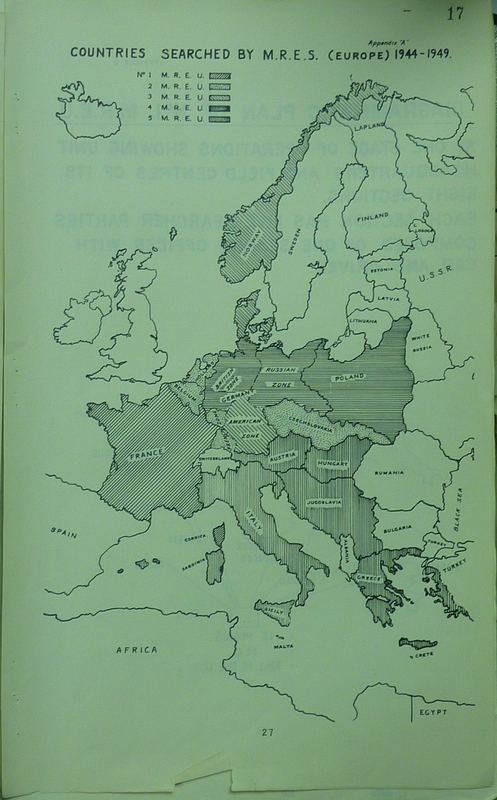 Other sources of information during the war were reports from allied agents in enemy or enemy–occupied territory, from the French, Dutch, Norwegian etc. Red Cross country organizations forwarded by permission of the Germans, from French organizations such as the Anciens Combattants ( roughly corresponding to the British Legion) and from Air Attaches and others in neutral countries. Using these scraps of information, together with known details about which aircraft and crews had been reported missing, investigators could begin to build a picture as to the fate of some of the missing airmen. The information received was often obscure in the extreme and its solution demanded considerable detective ability. After D–Day and the liberation of parts of Europe, it was possible to make fuller investigations. Now it was possible to receive reports directly from the areas where the aircraft had crashed. Some captured German records helped, as did the many relics and personal effects that had been rescued from the scene by the people of occupied countries who had then hidden them from the Germans during the period of occupation. Identification of airmen who had died was assisted by the smallest of details such as a laundry mark on an item of clothing, the serial number on a service watch or the initials on a signet ring. It was painstaking and often harrowing work. In November 1944, the Head of the Casualty Branch and the Officer in Charge of Missing Research went to Paris, and during their visit it became apparent that there was a need for a single unit or branch to undertake and co-ordinate the work of investigating the many airmen who were missing. Consequently, in early 1945, The Royal Air Force Missing Research and Enquiry Service was founded. Working initially in France, Search Officers were dispatched to the places where aircraft were believed to have crashed. Their work involved interviewing local Mayors and their employees, local police, and anyone else likely to have information that would help. To begin with, the Casualty Branch sent Casualty Enquiry forms, detailing all known information to date about a particular aircraft and crew. The Search Officers worked with this information, adding to it where possible before writing a report to send back to London. From the outset the M.R.E.S. worked in close cooperation with the Army Graves Service. The Army was responsible for the exhumation and concentration of graves into British / Dominion Military Cemeteries, and for their registration. A Dominion Air Force officer was normally present at the exhumation to help in the identification of bodies known or believed to belong to one of the Air Forces. Once all the facts and the burial place were known the M.R.E.S. arranged for the Graves Registration Directorate to register and mark the grave. When this was completed a case would be considered closed. Eventually it was realized that due to the number of crashes to be investigated a more methodical approach to locating and investigating them would be required. After dealing with the Casualty Enquires from London, Search Officers would then search in their area village by village and district by district. In April 1945, a second Section was set up in Brussels. Eventually, sections were also established in Holland, Denmark, Norway, Italy and Germany. Searches were conducted in each of the countries by Officers working firstly from the Casualty Enquiries and thereafter by covering the country village by village, district by district. With the increasing volume of enquiries as the MRES moved their searches into more and more countries; there was a requirement to recruit more Search Officers. Therefore, in August 1945, the Air Ministry, without mentioning the type of work to be undertaken, sent a letter asking for volunteers to work overseas. Those who volunteered then reported to the Air Ministry Casualty Branch to be interviewed for selection. During their selection interview they were told the type of work that they would be required to do if selected. The volunteers then returned to their centers to await the decision of the Air Ministry. Volunteers selected after this interview were then asked to return to the Air Ministry Casualty Branch to attend two days of lectures regarding the type of work that they were to undertake with the MRES. After being given time to arrange any personal matters in the UK, they reported to St James House in London on August 30th and were flown overseas to complete their training in the field. After spending around a week in the field accompanying existing experienced Search Officers, they joined a Section. The Sections generally comprised a Commanding Officer and Six Search Officers. These Officers then commenced their own investigations in the countries that they were dispatched to with their Section." For 5 years teams of the MRES, led almost entirely by ex–crew officers, scoured Europe, the Middle East and the Far East for missing believed killed airmen. Crash sites and graves needed to be found, and then identified. To close a case would involve the exhumation of bodies that had been extracted from wrecks and may have been buried, often several to a grave. The MRES activities were actually closed down in 1949 in Europe and 1952 in the Far East (Korean War) against the recommendations of its staff – who still maintained that there was further work to be done. However public and political demands to cut budgets won out. MAGNITUDE OF THE PROBLEM FACING M.R.E.S. & INITIAL MANPOWER COMPOSITION OF M.R.E.S. Of these, some 57,000 were from Bomber Command alone, and more than two thirds of these Bomber Command crew had no known fate. Around the world, 41,881 men and women had simply disappeared and were listed as missing, believed killed. The bulk of them, some 37,000 of them were missing believed killed in Europe. Tens of thousands of RAF personnel still lay in their aircraft, or buried in hurried and poorly marked graves. The public simply expects the debts of "the many" to "the few" to be paid in full. There was no precedent in history to follow–up on the missing, presumed dead, casualties as a consequence of long range bombings and air missions. For the R.C.A.F. circa July 1946 this meant some 30 Canadian officers and 40 airmen were attached to the MRES. My search area while with the No. 3 M.R.E.S. included: Denmark, Norway (taking me to the north eastern tip of the country into the Arctic Circle) and later in the American Zone of Germany.